At the end of 2016 we were faced with a bit of a player shortage. In the past we had always managed to fill the gaps in our squad by developing younger players or recruiting through trials. As well as the usual round of graduations and evacuations, several of our regular players, including our previous two captains, decided to take a step back from Ultimate to focus on other priorities. The previous season yielded our best results in the Open division so far but it left us all a little weary by the end and in need of a break. As a result, no one was really keen to continue the momentum into the off season or step up to run the team and start planning for 2017. The biggest threat to the team however was the looming Worlds qualification year. At that point the UK only had two confirmed bids in each division and although we expected there to be more there was no timeline for a further announcement and no certainty that we would be awarded more spots. Breaking into the top two meant beating either Chevron or Clapham, the two stalwarts of the UK open scene. Clapham were once again the European champions and our last game of the season had been a 15-4 defeat to Chevy, so although we had progressed massively there was understandable scepticism about our ability to claim one of the available bids. I think if we’d known at the time that a 3rd spot would become available there would have been no hesitation in pushing forwards with the open team and I have no doubt we would have been in that top 3. The alternative was to mount a challenge in the mixed division where qualification seemed more achievable with less established teams competing at the top. We had faith in our ability to mould and develop a new look team and our recent results in the open and women’s divisions meant we were confident we could compete at the top level of mixed. The biggest problem was that Scotland already had a successful, dedicated mixed team in the form of Black Eagles. They won Tour in 2015, had been to World’s and Euros before, and recently made the final of UK Nationals. In comparison, our mixed pedigree was seriously lacking. Although we had been pretty successful two years ago, we had never really focused on mixed and the recent season was a bit of a shambles. There had been some discussion between ourselves and the Black Eagles captains about some sort of merger between the Glasgow and Edinburgh squads to create a super team to go to worlds. Phil and I put some serious thought into it, we are good friends with a bunch of them and it would have been great to join up with the Fusion lads again. But we were wary about how it would affect our club long term as it would take a competitive focus away from Glasgow and likely expose less of our players to high level ultimate. From a personal point of view I wasn’t intending to go to Worlds and couldn’t fully commit to a squad with that primary goal. I was happy to keep the focus in Glasgow, where I could train locally and continue to progress our player base. 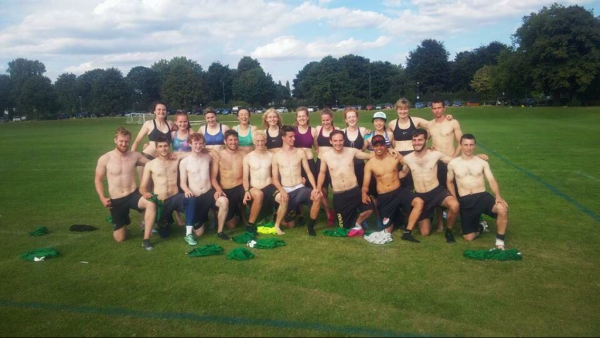 2017 Trials for GUX, the Glasgow Mixed team. The Eagles road to worlds was seen as a safer bet compared to a Glasgow team competing in either open or mixed. They also had a very clear directive to recruit, train and qualify for the World Championships in the mixed division while we were still trying to find captains to run teams and decide where our focus should lie. The chance to play worlds doesn’t come around very often and several of the players we had hoped to retain decided to trial for the Black Eagles squad. I know some people were a bit put out by it but I certainly understood the temptation and don’t hold it against anyone. I don’t expect people to feel any sense of loyalty to our team, I know most players just want to play at the highest level possible, especially when they are young or approaching their prime so it’s natural to want to join the team that gives you the best chance to do that. Once a few people went, others followed, either to be part of a stronger unit or just to join their friends, another strong motivator. Several of the Glasgow based players are still training with us regularly and helping to contribute to the club so there are definitely no hard feelings. In the end we took account and were left with only a handful of guys from the previous season’s Euros squad and the prospect of taking on Chevron for a Worlds spot felt all the more daunting. Luckily we still had 5 or 6 really strong girls that we could build a team around and the decision to focus on mixed was pretty easy from that point. I don’t think many clubs could survive a similar loss in experienced personnel and still consider pushing for Worlds qualification but we had invested a lot of time developing local talent and there was a new generation ready to step up to the plate. We knew we had our work cut out for us but we were still confident about putting a team together that would be ready to compete at Nationals. 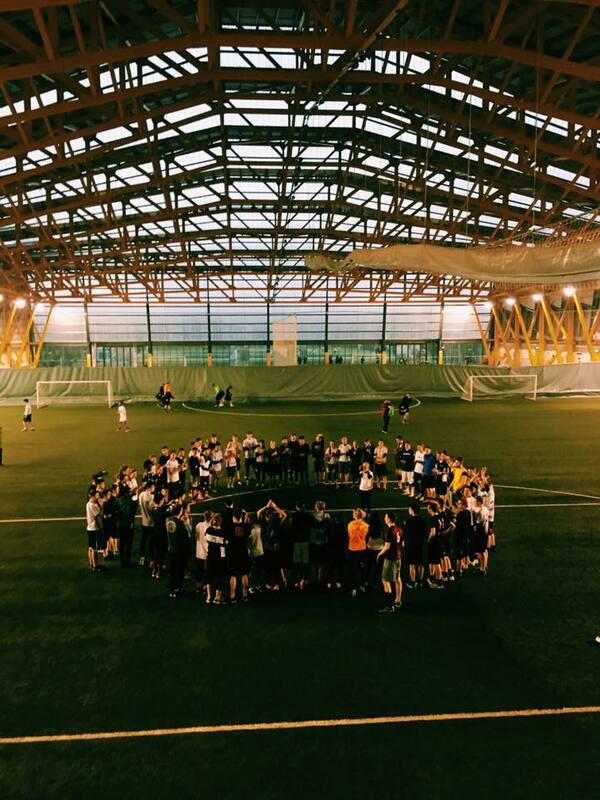 We held trials that winter at the big indoor arena at Ravenscraig and selected a large squad of more than 40 players. The idea was to use the Tour season purely as development and as a prolonged trial to select the team that would go forward to Regionals and Nationals. We selected a lot of university players, particularly from Farflung where the bulk of our coaching efforts were focussed. Axel Ahmala (Glasgow Farflung) and Katie Flight (Strathclyde Dark Horses) were appointed to run the team, both had good club level experience and were part of the GB u24 development squad at the time. It was the first time we had selected multiple captains as well as dedicated mixed captains and they brought a great dynamic to the team. Katie inspired us on and off the field with her energy and work ethic and Axel kept us focussed and in check with his confident leadership. Katie and Matt Tomlinson also volunteered to run the Women’s and Men’s teams that season to ensure we still had single gender trainings and got teams to Tour events. Fraser MacDonald and Alice Si were both new additions to the Glasgow scene and they both brought a level of exuberance that immediately impacted our training sessions and set a bar for both genders. 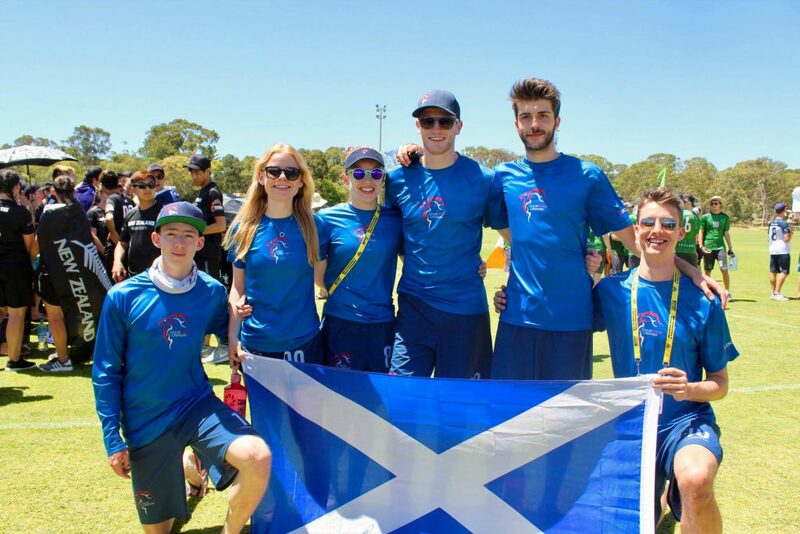 Glasgow University player Duncan Webster joined Katie, Axel and Fraser on the GBu24 development squad giving us a core contingent of international representatives. It was great to watch all four of them develop their skill sets, athleticism and bring new found confidence back to our squad. The GBu24 “Scots” included Katie, Axel, Fraser and Duncan. We set about training hard and regularly, trying to get through a lot of teaching in the first part of the season so we could bed down and focus on performances in the second half. Because of the previous focus on Open, many of the guys in Glasgow have at least a 5 year head start on most of the girls when it comes to high level training, knowing our tactics and competing at the top. We tried to start the season at a base level, treating everyone as equal members of the squad, but we knew we would be relying on the experience of key individuals when the time came. The ethos of treating your new players like old players and your old players like new players is a great way to keep your veterans on their toes and create an inclusive team atmosphere every season. I’m not sure we are always good at doing that but we try. The Tour season pretty much went to plan, finishing in 6th place overall and sending second teams to a couple of the Tours. We weren’t expecting amazing results but we were able to field a lot of players, get some wins over the big teams and figure out our best connections as well as a few mixed specific tactics. We then filtered down our squad to a group of about 30 that were available across the summer and good enough to push for selection to the Nationals team. We upped the volume and intensity of our training sessions and reinstated the custom of a training weekend away. We spent 2 days and nights in Pitlochry, training during the day, drinking and playing games at the campsite at night and jogging at 3am in the morning. It was a lot of fun on and off the pitch, fine tuning our team and getting to know each other a bit better. It helped to shape the identity of the team going forward after starting the season as quite a large squad. We also took a trip to Dublin’s Golden Cup as a warm up tournament. It was supposed to be the dress rehearsal for Nationals but we lost key players to the GBu24 team that attended and had to draft in a few extra players. We started lethargically, struggled to maintain focus and ended up outside the top 8 on the first day. We took the evening off, had a horrendously fun night at the party and approached the games with a different attitude the next day. 11th place wasn’t the result we wanted but it was definitely a wake up call for us. I think realising how bad we could be when we weren’t willing to put everything into a game was another important lesson in the context of the season. When Nationals rolled around 2 weeks later we were focussed, motivated and ready to hit our peak. Only a place in the final would guarantee qualification for Worlds and we had a tough task ahead of us. The schedule required us to finish in the top 2 of the group to advance to the semis but everyone was out to finish top to avoid taking on Black Eagles. 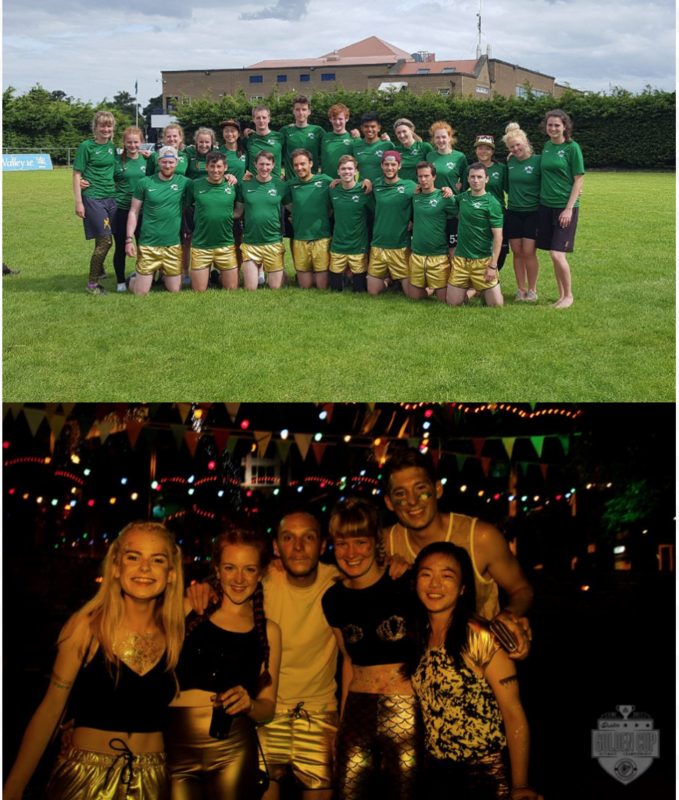 Eagles had dominated Tour with their two split squads finishing first and second overall making them overwhelming favourites for the title. We faced reigning European champions Reading first up, under no illusion that they would be an easy opponent but aware that a win would put us on the better side of the draw. It was the most confident start to a game I had seen from us all season, we had formed a team and trained specifically for this tournament, this day and this match and everything seemed to click into place. We stuck to our own game, playing aggressive but patient offense and threw a few zones at them on defense. We took half and then pushed on swiftly to a 15-10 win from there. The win gave everyone a ton of confidence, it was the first time we had really put our full strength team together as a finished article and realised our potential as a squad. We followed up with a 15-8 win against JR who made life difficult for us contrary to the scoreline and a 15-2 demolishing of Mighty Hucks to assert our dominance on the group. Day 1 of Nationals was a lot of fun, one of the best days I’ve had playing Ultimate and to cap it off we finished up top of the group and the number 1 seed. The biggest reward was putting ourselves in the game to go, a semi final vs Smog. I didn’t sleep well that night, I was just ready to get the game started, full of anticipation and keen to get going. We had faced Smog several times across the season and many of those games had ended in sudden death so we knew we were in for a battle. They had gone close against Black Eagles the day before and looked like they were also in peak form for Nationals. There was a lot riding on the game, a place in the Nationals final as well as guaranteed qualification to that year’s European Championship and the World Championships in 2018. Very few of the players on either team had been involved in such a big match before so there were definitely some nerves floating about. We traded for the first 6 points which helped to settle us a bit but then suffered consecutive breaks to find ourselves 6-3 down. Our defense line were clearly not ready to lie down and pulled back the deficit with some fine blocks allowing us to take half 8-7. We took the first point out of half and moved into a commanding position with the end almost in sight. Smog noticeably raised their intensity but we still found a way to put in our O points. A highlight reel grab from Fraser under intense defensive pressure seemed to sum up the match at that point, both teams going toe-to-toe but us keeping our noses in front. At 11-8 our defense line got another block and came agonisingly close to converting before Smog held and the cap went on for a game to 12. And that’s where it all fell apart, we got lost somewhere between trying to force the disc in and playing too safely. We either lacked penetration and gave up easy turns or threw the disc long to their deep poaches. Looking back I think I counted 7 possessions to win the game, the odds were very much in our favour. Smog did well to fight to the end although their offense on the sudden death point was about as rash as ours. There were 6 turnovers in that final point before they lobbed it into the endzone and came down with the win. It was definitely the hardest defeat I’ve had to deal with, it took a long time to get over and the game will always stick in my mind. It’s pretty unpleasant to watch the footage back and my mind replayed those final points over again for several weeks. The team were absolutely gutted, there were a few questioning tactical decisions and choice of lines towards the end of the game but I think that was pretty harsh. The same strategy got us to 11-8 up and if we’d only converted one of those many possessions there wouldn’t have been any doubt. Not making the final was tough but losing by a single point was even tougher. We were one point away from the entire season being a success, from validating all of our choices and processes that year. A single point from justifying our decision to switch to mixed, our trust in sticking with our local scene, our faith in fresh talent and our ability to coach and build a successful squad in a short amount of time. It was incredibly tough to pick ourselves up and move on, we knew there was potentially another Worlds spot available but to be honest we were more focused on our achievements that season. We aimed for the final, we wanted to be at Euros and it was tough to motivate ourselves for a 3rd place bid that didn’t even exist yet. We got through the crossover by beating JR 15-10 and faced Reading in a rematch for 3rd place. We weren’t happy about having to play an important game back-to-back, especially as 3 of our key players needed physio time to get back on the pitch. Reading had a relatively easy morning compared to us, losing then winning games with a 15-5 scoreline. They clearly had more energy than us but their motivation for revenge and professionalism to be mentally and physically prepared for the last game of a long tournament was admirable. You may have guessed already but we lost, unable to muster the fighting spirit we often relied on. We went home pretty dejected but proud of our efforts and performances for most of the tournament. Reading were soon offered the 3rd bid for Worlds and even a bid for Euros where they ended up finishing 3rd. Devastated and shirtless after Nationals 2017. At the end of the season we took stock of our achievements and decided to press on. We had taken our foot off the pedal at the end of the previous year and it had ended up affecting the whole outlook of the team. We asked ourselves what we would do if we were going to Worlds and we decided to proceed with that mentality. Firstly, we knew there was a large gender imbalance in our team and we had relied more on the experienced men to produce our best results. We wanted to address that balance and to bring more players into a competitive atmosphere and positions of leadership. 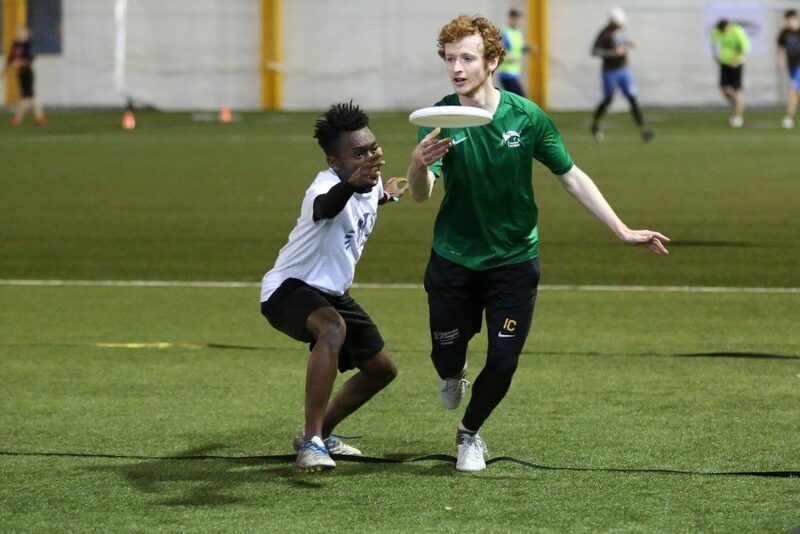 We setup a regular training group open to all club members to train across the winter and share tips on all aspects of skill development and conditioning for Ultimate. To be honest it was hard to maintain a strong level of commitment and desire without a unified focus but we managed to create an atmosphere where people could push themselves, try new things and take on new roles. Around mid December I awoke to find an email from UKU in our club inbox informing us that a waitlist bid had become available for the World Championship. I was immediately excited but dubious about whether we would still be able to raise a team. We had a similar experience earlier in the year when our open team had been offered a late chance to attend the US Open. There was an initial flurry of excitement followed by a cloud of realism as we added up the cost of the tournament and looked at how many people were available and in the end we had to decline that offer. I set about polling for interest from the current squad and this time it looked more feasible. We set up an emergency meeting with our new mixed captain Iain Campbell and recruited a bunch of additional experienced players to put the early plans into place. Everything else club related got moved to the back burner while we set about announcing trials, organising logistics and recruiting new members to strengthen our team. First we had to deal with the loss of 3 of our best D line men and one of our best female cutters. Fraser and Alice had trialled and been selected for Smog in the interim, Duncan tore his ACL at the u24 World Championship and Joel Terry ruled himself out of selection although he planned to join us for the domestic season. We made a tough decision early on to make some of our squad from Nationals retrial, either because they were on the fringe of selection or unable to commit for a full season. The draw of Worlds brought some new faces out to trials and in the end we selected 4 new men and 3 new women to our team. Zsofi Marozsak and Jae Sng are further additions from Farflung that we obviously knew well and were pleased they wanted to commit to the squad this year. Zsofi is athletic and confident and adds a new dimension to our offense line while Jae has really solid handling skills and plays defense with passion. Kat Gregory was a new face to us but she really impressed at trials. We probably would have selected her anyway just to have another Kiwi on the team but it turns out she’s really good. She’s one of the hardest working cutters on the field, speaks up when required and it’s great to have another confident female presence on the team. Ian Tait played a bit with us last year but is now on a full time contract, he’s obviously our go-to endzone goon but he’s capable of so much more than just being tall. He gets a lot of reaction blocks for us and isn’t afraid to throw himself around which is rare for someone his size. We were really pleased there was room on the squad for the Strathclyde pair Andrew Warnock and Ben Cornelius. They had both been training with us over the winter, had improved massively over the course of a successful university season and still have a ton of potential. Jonny Ridley was a real bonus and wasn’t on our radar until he signed up for trials and showed us speed and aerial ability. The new additions have brought a better balance to the team this year and allowed us to fill roles that we lacked the previous season. I had never seriously considered going to Worlds when we started the attempt to qualify over a year beforehand, I wasn’t sure I wanted to commit the time or money and at that period I wasn’t really motivated to keep playing for another 2 seasons. After our failure at Nationals I was sort of looking forward to semi retirement, I’d laid out my plans to join a tennis league, take a few mountain biking trips and was relishing the prospect of all those free weekends in my calendar. But when our late bid was confirmed I couldn’t really say no. I had kept up with training and was feeling in good shape, the tournament was in sight and after a few months without competition there was definitely a desire to be involved again. It would have felt really strange to not be there with the team and I guess that’s what made up my mind in the end. GUX make it to a final at last! MT3 2018. From the outset we were set on taking a smallish (compared to other teams) squad of 20-22 players. Success for us will be determined in the first few days of the tournament by getting into a bracket where we can compete with teams at our top level. If we fully expected to still be in contention by the end of the week then perhaps we’d have considered taking extra legs and resting key players early on. I don’t think we have the luxury of resting our best players and still expecting to win games at that level and we know how hard it is to get invested in a game when you are only playing 1 in 4 points. We also wanted the squad that was going to get a real positive experience for the time and money they were spending without pitch time affecting team morale in any way. Injuries are a potential issue but we still have 3 full lines of players and a physio on hand to get us through. We feel that this size of squad gives us the best chance of winning our early group games but we’ll have to see if it pays off. On top of the Worlds team we also selected a 40+ training squad full of promising, committed players. We didn’t want to focus all of our efforts on a specific group of 21 players that might need a break from Frisbee (physically and financially) by the end of year or be moving away altogether. We realise the probability of winning or even medalling at Worlds is extremely small so the end result is not that important to the club. What’s more important is the process, the experience gained and passed on and the number of players exposed to the ins and outs of preparing a team for a world championship. The training squad have been subjected to all of the same build up, practice sessions and team conversations (minus the boring AirBnB and car hire chat) to try to ensure that everyone gets more out of this year than ever before. We want to feel like a club going to Worlds rather than a select group and we hope that those lucky enough to attend will help promote the development of our club in future and create some form of legacy. We also wanted to maintain focus on the domestic season. That’s our bread and butter and we want to be a team that challenges at Nationals and qualifies for Euros every year. Worlds is really just a bonus for us, a fun and exciting opportunity and hopefully a vehicle to push our squad to the next level. We plan on continuing after Worlds, try to make that Nationals final this time around and get back to Euros. For a long time we’ve built a team around glorious failure and overachieving and I hope one day we can be more than that and genuinely win something big. Few of the mixed teams from the last WUCC actually exist anymore and we don’t plan on disappearing into the ether. We want to be at the 2022 championship and maybe we can think about reaching semi finals then. Glasgow 2, made up of members from our larger training squad, finished 12th at MT2. We are aware that we have a very young and inexperienced team. There are a few old boys but the majority of the squad are under 25 with very little high level experience. 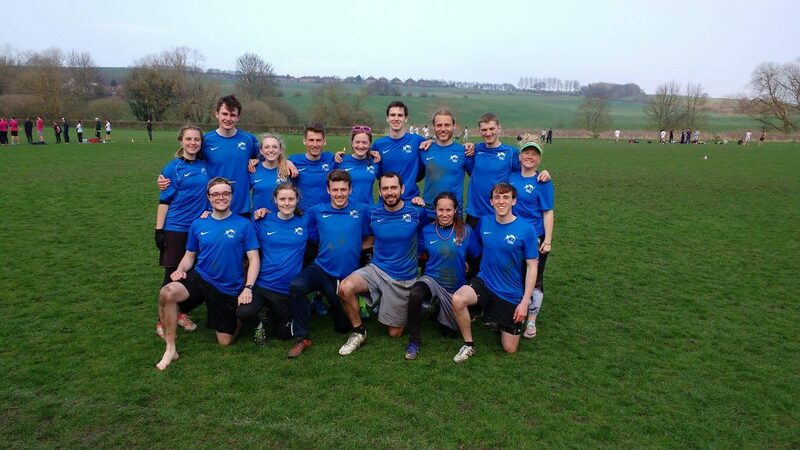 It’s probably the biggest difference between us and teams like Reading and Black Eagles that have a core group of players in their prime with a lot of international ultimate under their belts. Our potential is high but our low points are much lower than these teams and we’ve seen what happens when we aren’t 100% focussed mentally and physically. We’ve asked our players to step up very quickly and everyone has responded brilliantly. A lot of the guys on our Euros open team were rookies or fringe players but have seamlessly moved into senior playing roles across the course of a season. Matt Tomlinson has gone from being an average club player to a fixture on our O line and an elite player (Let’s go Chevron!) in his own right. Rory Curran has hit form again and his consistent throwing is earning him MVP nominations every weekend. Harriet Hopper and Rhona Gordon have built on their experience of a couple seasons with us and their senior roles with Swift to become leading players that help to fill those experienced roles. When Iain Campbell decided to try captaining for the first time this year he didn’t realise he’d be leading a team to Worlds. But he’s taken it all in his stride and put a lot of thought into structuring the team, planning our training and managing the squad as a whole. Audrey is still Audrey, she’s as devastating as ever in and around the endzone and gets better every year. Phil nearly missed worlds having booked in for a shoulder reconstruction around the time our bid was confirmed. He started playing again in May and is already back to his best with a new arsenal of lefties at his disposal. The younger players are making a big impact as well, Sam Finlay had no real club experience before joining us last year and quickly became a star of the team. Everyone knows how good Joel Terry is for only playing for 3 years. Ruth Tayler and Megan Brass made it onto our team last year simply for being fast but they’ve added so many more dimensions to their game that they are now indispensable. Kim Marsh is virtually a veteran having played with us for 3 seasons and in that time has progressed from a novice cutter to a smart dependable handler and athletic defender. 2018 has gone pretty well so far, we made semis at Tour 2 and made our first final at Tour 3 which included wins over Smog and Black Eagles. Many people will say we didn’t deserve to get our place at Worlds after missing out on qualification but for us that tournament is now in the past. Whether or not we deserve it we have shown over the course of the year that we’re good enough to go. We’ve beaten each of the 3 UK teams above us in the last 3 domestic tournaments and we put in some really good performances against top European teams at Windmill. We missed out on the quarters in Amsterdam by 0.1 Swiss points, the matter of a single goal in any game but we came out with wins against other Worlds teams and came very close to beating one of the finalists. 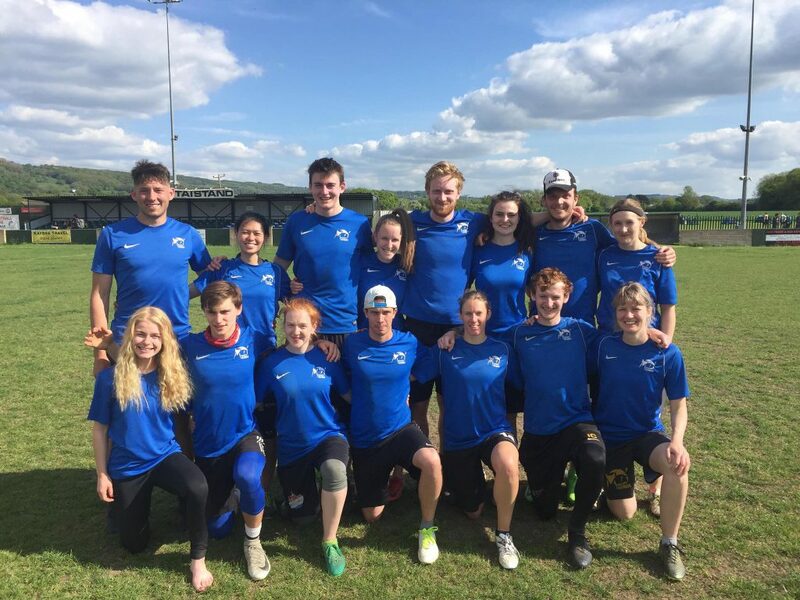 It was a first taste of international Ultimate for many of our squad so it was good to gain that experience and get use to playing new teams with different approaches and strategies. I think we’re as ready as we’ll ever be and I’m really excited to see how we handle the big occasion. I landed in Chicago yesterday so it’s all real to me now and I can’t wait to get started. I’m also excited to see how the other UK teams get on, particularly Black Eagles. At home they are our biggest opposition so I’m always secretly hoping they’ll lose, but at Worlds it’ll be fun to just watch and support them. We all know each other pretty well and we respect what they have done over the last few years and they set the bar for us as a team. Warming up for Worlds at Windmill in our new shiny kit. I’m not going to be so bold as to predict a finishing position. To be honest the numbers only matter to me if we’re in the top or bottom 8. If we’re anywhere in between then the performances matter more. As long as we can challenge in games we are capable of winning then we’ll come away having learned something new and improved as a team and we’ll take that into the next tournament we play. If you’ve made it this far then I applaud you. Hopefully you didn’t persevere in the hope you’d get a mention and are now ruing the time spent reading through four chapters and questioning your self worth. 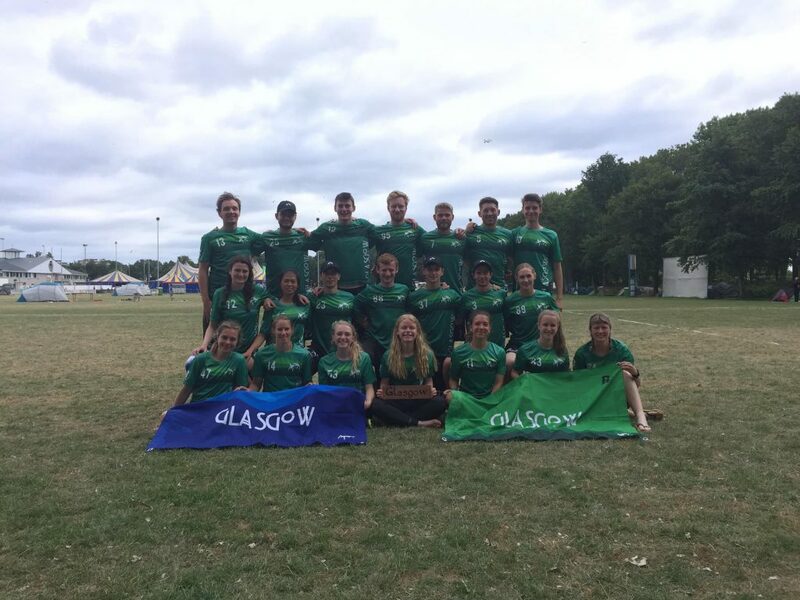 It’s by no means a comprehensive history of our club or all that Glasgow Ultimate encompasses but I hope I’ve catalogued the milestones that have shaped our competitive teams and led us from the B-Tour to Worlds. Thanks to everyone that has contributed over the years, whether it’s taking on responsibility to run a team or an event or just showing up to summer league regularly, it’s all helped to build the community we have today. Here’s to 2019, 2022 and beyond.